It’s such a privilege to be able to work with the students and teachers here at Vidya Sagar. Already with a pretty high level of English, working with the classes here has been exciting, fun, and a learning experience for all of us! The owners of the school are the most kind and generous hosts and have left me free to teach however and whatever I choose. Thrown in the deep end from the first day, I’ve been working with classes two to eight having a go at creative writing, poetry and creating a school newspaper, and in the final few weeks I’m working with classes seven and eight to perform a short play for the rest of the school. The enthusiasm the children have for learning is inspiring, and their unquestioning interest and commitment to their education makes the work an absolute pleasure. One of the highlights of my time here so far was having the opportunity to introduce the older students, and some of the teachers, to the concept of Easter and how we celebrate it in New Zealand. On Good Friday we held a small celebration at the school, where I told them about Easter and why and how we celebrate it, followed by each student blowing and decorating eggs and a short Easter story. And of course, Easter Eggs! I’d brought enough for each student from home, and the looks of excitement, followed by confusion at what the little foil wrapped ball was one of the highlights of the day. India is a secular state, but their interest and openness to learning about other cultures and traditions makes it a real joy to share traditions from home. Leaving New Zealand I really wasn’t sure what awaited me here in Sikkim, but the experience has exceeded all my expectations. The warm and welcoming hosts (and fabulous food! ), amazing children, natural beauty, and opportunities to explore the local area in the weekends has made my time here so far completely unforgettable. I know the last couple of weeks are going to fly by and before I know it I’ll be back in Delhi airport, but if there’s one thing the people here have taught me is to take each moment as it comes and live in it, just as they do. If spending time teaching in a school like Vidya Sagar is something you’re even vaguely considering, I couldn’t recommend it more highly. I’m not exaggerating when I say it will exceed all your expectations, and is absolutely life changing. 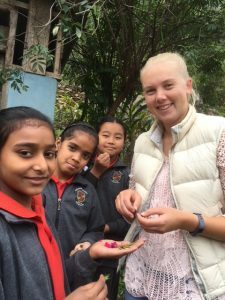 It was really hard for us to manage the school, the hostel and the course at the same time but Sophie came to our rescue. A Big Thanks! to HELP for being so kind to us. It is the perfect timing to have volunteer like Sophie. She is helping us a lot in the school as well with our course. Being a trained teacher she has experience of doing all the things related with the course. We are really happy with her and she seems happy too. Her work is really appreciated. We feel that each time we get a volunteer we get the best one.